The 15,000-square-meter (161,458 square foot) Tagus Linear Park in Portugal is set by the riverside within a former sand deposit and comprises 3.7 miles of pedestrian trails. The designers at Atelier Difusor de Arquitectura and landscape architects at Topiaris established a new connection between the beach and natural areas by introducing 2,297 feet of raised wooden paths that end at a Bird Observatory built from recycled shipping pallets. The project combines recycled materials such as tires and old pallets to create a space for environmental education, leisure and sports. 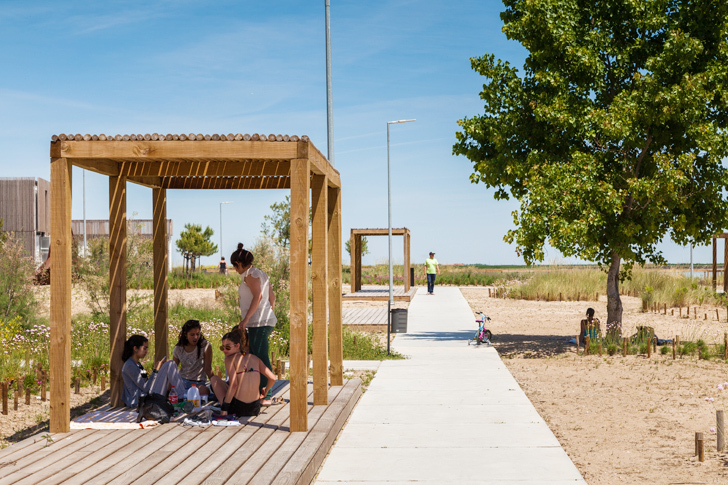 Located in Povoa de Santa Iria in Portugal, the park aims to provide the inhabitants of adjacent urban communities with access to the riverside and a direct contact with the river which has, until recently, been blocked by large industrial lots. Now, people of all ages and from different walks of life spend their free time here and engage in sports, fishing, walking and cycling. The park comprises a single multifunctional area named Fishermen’s Beach and 3.7 miles of pedestrian trails that connect urban and natural areas and converge to the beach. Several types of structures were built for educational and recreational purposes. Fishing platforms, shelters, volleyball courts and a playground made from recycled tires create an interesting and dynamic space. The network of paths, made from concrete slabs, is surrounded by plants that contrast the sand area. At night, the area is lit with 100 percent solar-powered lighting. The project combines recycled materials such as tires and old pallets to create a space for environmental education, leisure and sports. 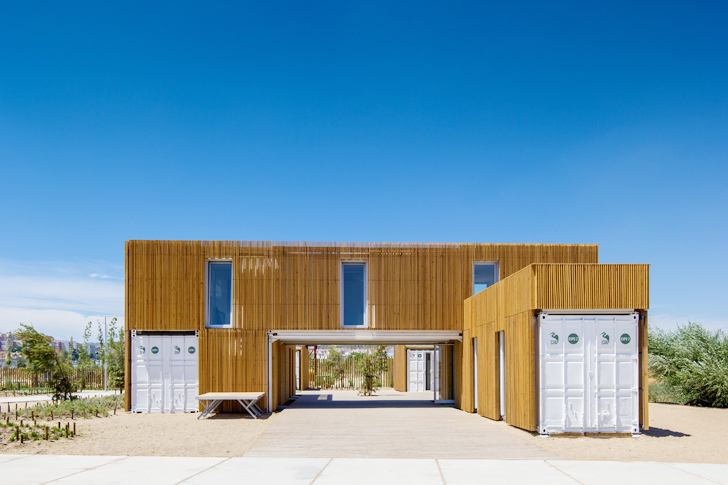 Located in Povoa de Santa Iria in Portugal, the park aims to provide the inhabitants of adjacent urban communities with access to the riverside and a direct contact with the river which has, until recently, been blocked by large industrial lots. Now, people of all ages and from different walks of life spend their free time here and engage in sports, fishing, walking and cycling. The park comprises a single multifunctional area named Fishermen’s Beach and 3.7 miles of pedestrian trails that connect urban and natural areas and converge to the beach. Several types of structures were built for educational and recreational purposes. Fishing platforms, shelters, volleyball courts and kids’ playground made from recycled tires create an interesting and dynamic space.